Have you ever thought about ways to Start Your Own Blog? Maybe for promoting a business, or just for making additional income? 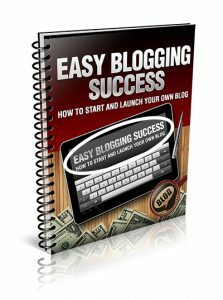 If so, then you will want to grab this free eBook and learn the secrets to making residual income from your own self hosted WordPress Blog. Most people that are blogging are using an affiliate blog, and not their own. Don’t make this mistake and lose leads and commissions to someone else. Reap the rewards yourself by learning these simple and lucrative secrets. In this free eBook I will walk you through the steps for building your very own self hosted WordPress.org blog. In this eBook I will also share some of the money making secrets that most people haven’t even heard of. How to put everything in place, what to promote and much more. Go ahead and get this eBook now! Everything you need to know is inside this eBook just as I’ve mentioned above. Simple, easy to follow steps that you can do quickly, or a little here and there as you feel comfortable doing it.